Sonia Illescas, the company celebrates the artistic integrity of older dancers and challenges preconceptions of what it means to be older. 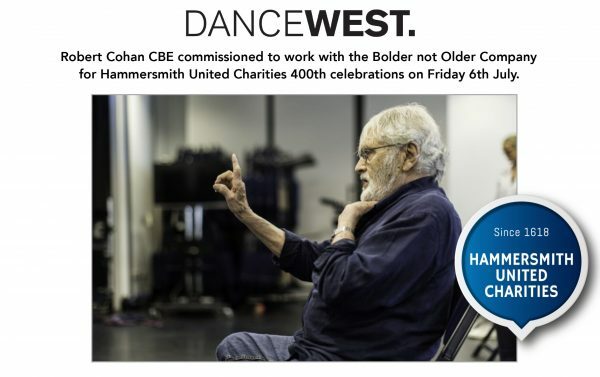 93-year-old Robert Cohan will work with the company over an intensive weekender from 9-10 June contributing towards a piece that the group have been preparing for the opening of Hammersmith United Charities 400th celebrations on Friday 6th July at St Paul’s Church Hammersmith. Yolande Yorke-Edgell, artistic director of Yorke Dance Project and founder of Cohan Collective will be supporting Robert on the weekender. by Robert and those who have been inspired by him. Robert Cohan’s influence on the development of modern dance in Britain has been considerable. Having pioneered the teaching of contemporary dance technique in Britain, he was instrumental in the development of a vast following, not only for the repertory of LCDT in the ‘70s and ‘80s but through his pioneering residencies throughout the country, which laid the groundwork for the many other British companies that have grown up in the last 20 years. You can download and read Robert Cohan biography on the right.